These are great and NO CHEMICALS!​ They will actually help to dry your load of wash quicker because the wool helps to absorb the moisture - you do not need to worry about the dryer balls drying, they dry as the clothing dries! Dryer balls make a perfect toy for a baby! You may throw it in the washer and dryer to have it clean and it is 100% natural and large enough that the baby has no chance of choking or pulling any of it off while teething........simple, practical & safe! You may add a scent to the dryer balls with "essential oil" (4-5 drops per dryer ball) - allow it to sit and dry overnight and since it is not actually "oil", it should not stain any of the clothing! The only items that the wool dryer balls will not remove the static is polyester (such as nylon slips). The dryer balls will last for years! What do you do with the dryer balls when you are not drying your wash? You may simply store them in the dryer (don't forget to clean the filter w/each load as you should always do), you may display them in a wooden box or an old strainer but this depends on how you decorate you home - be creative! How long do they last? I have been using the same 5 for almost 5 years! Warm feet, soft walking = great day! 100% wool from my sheep !!! 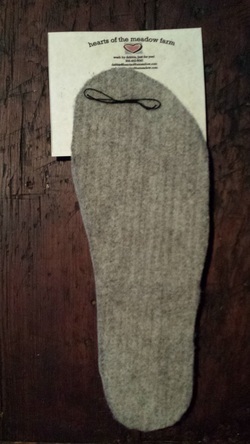 Shipping is via USPS and is not high, the insoles do not weigh much at all. They will keep your feet warm and your walk soft and that will give you a GREAT DAY - ENJOY! Felted cat toys are assorted in colors. 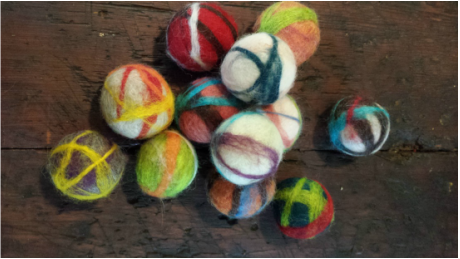 Felted balls are in assorted colors.